She glanced to a painting of a young girl, hanging on the wall. What more could she have done? The man was rich, powerful, and more manipulative than anyone she’d ever known. She had gone all the way to the mayor looking for help. Well, to his wife, Darla, but even she had to admit how outrageous her claims had sounded. Gregory Chessman did seem incapable of anything that wasn’t wonderful. She fought hard, kicking and swinging her frail arms, trying to break his hold, but she couldn’t make contact beyond his forearms. Her vision blurred, her starved lungs burned, craving air. Her limbs turned leaden. Then the brilliant light flooding the studio faded to black, and she knew no more. October 9 “It’s a bad business decision.” Behind the wheel of the red Jaguar, she checked her rearview mirror, uneasy at being where she shouldn’t be after dark. “Maybe,” she braked for a traffic light, “but it’s a good heart decision.” The man on the phone grunted his true feelings; his words proved far more diplomatic. “I understand that position on some of your ventures, like your work building the children’s center, but I don’t understand it on this. We’re talking about a run-down beach house three states away with exorbitant taxes and insurance that you never visit. Retaining it isn’t logical.” Her aunt Beth had loved that run-down beach house, and they’d spent almost twenty wonderful summers together there. But maybe you had to grow up orphaned and denied the privilege of living with your last blood relative to understand the value of that. “It’s in hurricane country and eighty feet from the gulf,” she told her financial advisor. “Of course the taxes and insurance premiums are outrageous.” Two blocks ahead, a jazz funeral ambled down St. Charles Avenue. Bluesy music floated on the night. Not wanting to intrude, she flicked her little finger, tapping on the blinker, then turned at the corner and headed out of the French Quarter. Her uneasiness grew. There had been some police presence in the Quarter. Where she was headed, there wasn’t apt to be any. “That’s why you should sell it.” His sigh crackled static through the phone. “Look, it’s a good offer. Market value plus 20 percent is rare.” She looked down the deserted street. A group of teenage boys were hanging out in front of a half-gutted building. Yet another remnant of Hurricane Katrina; the kids had no place safe to go. She hoped to soon change that. In this neighborhood, being on the street at night wasn’t just unsafe, it was dangerous. “Now you’re upset.” “I am not upset.” If his tone got any stiffer, it’d make the trek from Atlanta to New Orleans without benefit of the phone. He was definitely upset. “Good.” She needed to get past this call and focus on returning to the hotel. Trash littered the sidewalk and clumped in a pile near a storm drain carved into the corner’s concrete. Smelly garbage, rain-soaked and muddy from that afternoon’s thunderstorm, assaulted her. Finger to her nose, she looked from the grungy walk back to the street. “Why are these ‘blind’ buyers offering more than fair market value anyway?” “You’ve refused their previous offers and they want the property.” “Yes, but why?” That just didn’t make sense. “Dozens of homes are on the market. Why not buy one of those? Why Aunt Beth’s place?” “Who cares? Just take the money and run.” She didn’t live her life that way. “See, that bothers me. When people hide who they are and push this hard, there’s a reason.” This property was in Seagrove Village. She couldn’t afford to forget that or not to be suspicious. “Their reason doesn’t matter. This is the perfect time to unload it.” “I don’t want to unload it.” Without the beach house, she wouldn’t have any personal family memories after age seven—a fact he well knew since he’d handled her estate from the time of her parents’ passing. How could he not understand? “If you’re going to ignore my advice, then why pay me for it?” She paid handsomely for it, but it was still a bargain. “You’re a very good analyst, and I value your opinion, but I make my own decisions. Since I’m accountable for them, that’s as it should be.” He should understand that; he’d taught it to her. She pulled up beside a car parked near a stop sign. Sitting stopped on dangerous streets gave her the willies. She wasted no time scanning for oncoming traffic, and then drove on. “Why are you so eager for me to sell?” Even before she’d reached legal age and he had gone from trustee and replacement guardian to financial advisor, he never pushed her this hard on anything. “It’s in your best interests.” “In your opinion, but not in mine.” “I know you make the final calls—and how you make them.” He sighed deeper, heavier. “You’ve prayed on this and it doesn’t feel right, so you’re not doing it.” Well, at least he understood that much. “Yes, prayer is my bottom line.” Saying the offer didn’t feel right would do, but it was an understatement. Down to the marrow of her bones, she felt certain she was supposed to keep the beach house. As certain as she was that she must never return to it. God’s reasons on both went far deeper than her own, and if and when He was ready to reveal them to her, she’d be eager to know them. Until then, she would act in trust. Follow His will. “There is another reason you should consider and aren’t.” “Oh?” His brittle tone had her stiffening. This wouldn’t be good news. “A man purporting to be an investigator showed up at your neighbor’s house this afternoon looking for you.” No. Not again. Please, not again. Fear streaked through her chest, squeezed. No sound came out of her mouth, so she waited on tender hooks for him to continue. “You’re going to have to run again. NINA’s found you.” NINA? She had been running from men, not a woman. “Who is she?” “Not who, but what. NINA is the name of the group looking for you.” The men were a group? They had been scary; this was terrifying. “What kind of group?” “Nihilists in Anarchy.” She swallowed hard. “So the biological terrorist threat is still out there, and it’s bigger than I thought.” A group. An organized group. The taste in her mouth turned bitter. “I’d hoped if I disappeared…” “It didn’t help. These are not fly-by-night thugs. I wish they were. NINA is a multinational organization—far too substantial to let one woman interfere with their plans.” Her muscles went tight, knotted, and the urge to cry swelled inside her. She blinked fast, fighting it. “I have to disappear again.” “If you want to live, yes.” Her nightmares were starting all over again, and growing worse. “Are they connected? The beach house buyers and these people?” “What interest would a major terrorist group have in a shack of a beach house?” “That was my question to you,” she reminded him. “None known to the FBI. I contacted my friend there and made a few inquiries—citing a hypothetical situation again, of course.” “And his advice remained the same,” she guessed. “That I should come in and get into Witness Protection.” “Actually, no. With this new development, he doubts he can protect you. His hypothetical advice is to get lost and stay lost somewhere far, far away.” “So he was already familiar with this NINA?” “Oh yes,” her advisor said. “They’re on multiple national watch lists.” Boy, had she fallen into it. “I told you the men after me were bioterrorists.” She’d overheard that much. “Bioterrorism is but one of the threats NINA poses.” “There’s more?” The news just kept getting better and better. “Much more, I’m afraid. NINA embraces the destruction of all political, social, and religious order. They reject morals and ethics as mere products of pressure. Life, to them, has no meaning. Good and evil are based on perspective, nebulous things. They even reject the significance of family.” Alien philosophies. Spooky ones. And wasn’t that just great? Having a duo of cutthroats after her hadn’t been bad enough. She had to run into an entire army of them. “Charming. How did you find out NINA was involved?” He hesitated and then sighed. “It’s safer that you don’t know.” Not from the FBI apparently. Two trucks blew past her. One had a back end full of wooden crates that wobbled. She tapped the brake to put more distance between them, not trusting the ropes securing them to hold. “Did you tell your FBI friend that the men could be members?” “Of course not. You’d be pulled in for questioning and be at even greater risk. NINA would know the moment you entered the building—even my friend couldn’t deny it.” That was her take on the matter too, but it comforted her to know he had hypothetically discussed the situation with a professional, and he was in agreement. Clearly, he considered the men and the anonymous buyers two separate events—and they well might be. At this point, she had no way of knowing. “How did they find me?” “No idea. You’ve avoided the press, public gatherings… Has the media caught wind of your reasons for being in New Orleans?” “No.” She’d had a close call with a reporter from the Times-Picayune, but no direct hits. She’d grown adept at avoiding television cameras long ago. “No public records filed?” “Only the beach house deed.” “That leads to me, not you, and it’s in another state.” He sighed. “I have no idea how they located your current home. But don’t delay down there. They’re one step away. Vanish.” In ordinary circumstances, it would be unfortunate to be skilled at vanishing, but in this case, her having a great deal of experience at it was a blessing. “I’ll wrap up here in a few hours and then go.” “A few hours? That’s risky.” “Yes, but necessary.” If NINA knew she was here, they wouldn’t have been at her home this afternoon talking to her neighbors. And since she didn’t know her neighbors and they didn’t know her, she should be safe for a few more hours. That would be long enough. The kids here needed the center. She couldn’t raise their hopes and then dash them by leaving without doing anything. “Invoke your power of attorney. I’ll contact you again in six months—sooner, if I can—and when I do, I want to hear that this center is up and running.” “I’ll take care of it,” he said. “Our usual financial arrangement?” Her life, the dire straits of the kids here, and he was concerned about money. The man had plenty and was still fixated on amassing more. “Our usual arrangement is fine.” “Very well. I’ll decline the offer for the beach house,” he said, caving on that issue. “And I’ll pay the taxes and insurance.” “Tell the buyers we won’t entertain future offers too.” This was their third attempt in the three months since Aunt Beth passed away, and the fear of a fourth offer dangling like a dark cloud on the horizon she did not need. Not knowing their motivations sparked worry. Every time these mysterious people made an offer, it triggered more, and she stayed knotted up like a pretzel for days. Now she discovered her pursuers, who might or might not be connected, had an entire organization behind them, and it was hunting her down and closing in. That made these anonymous buyers a lot less intimidating. “I’ll tell them. Though it’s never wise to close the door on future opportunities.” “If I’m wrong, it won’t be the first time or the last. I’ll live with it.” “Very well.” He clipped his tone. “I’ll handle the matter first thing in the morning.” “On this NINA group,” she said, determined to try one last time to learn more. “I know it’s safer for me not to know how you found out about them, but have you placed yourself in jeopardy? I need to know that much.” “No, I haven’t.” “You’re sure?” “Positive.” That didn’t give her much leeway to insist on disclosure. “Just in case, you’d better tell me all you can.” “No. I won’t take deliberate action that pushes you further into the fire.” “But—” “No,” he insisted, then softened enough to add, “Let’s just say that sometimes people are the exact opposite of who they appear to be.” Which told her nothing. Who was the exact opposite of who they appeared to be? “That’s it?” “That’s it.” “Fine.” No sense arguing. He wouldn’t budge. “Thank you for everything.” His warning could take her out of the line of fire. At least she knew they had found her home and were closing in on her. “Take care. I’ll call when I can.” “Be smart about it, and do stay alive. You know how I detest having to rearrange my schedule.” Boy, did he. And for him, this comment was intensely personal. So much so that a lump formed in her throat. “I’ll do my best not to cause you any inconvenience.” She would; she always had. But would her best be good enough to keep her alive? More good news. He glanced at his watch—7:15. “So you’ve enacted the plan? With the red Jag?” That car was crucial for two reasons. One, to signal their men, and the other to signal a key player who didn’t yet realize he was a key player. The car would serve notice he couldn’t miss. He’d seen this moment in his mind’s eye a million times, and he’d studied at least that many possibilities seeking a different final solution. But all the seeking and sifting had changed nothing. In the end, the same simple truth remained. Pit anything—money, power, or blood—against survival and survival won. “Two twenty-two,” he said, relaying the code. 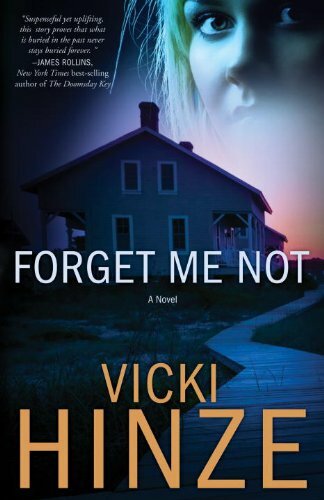 1.“Even when we forget who we are, at core level we remember whose we are.” That belief prompted author Vicki Hinze to write Forget Me Not. What core-level memory do you feel you could never forget? Why? Do you feel bad memories are more easily recalled than good ones? 2. Do you believe forgiveness means forgotten? The Bible states that repentance washes away our sins and that God no longer remembers them. Are human beings capable of that kind of forgiveness without God’s help? Have you struggled with forgiving but not being able to forget? Are there times when not forgetting is constructive? 3. Would it be a blessing to be able to forget parts of your past? Or do you feel it takes all of those parts—good and bad—to be the person you have become? Why? If you could wipe your memory clean and start over, how would you construct your life differently? 4. Do specific names evoke a specific emotion in you? If you could choose your name, what would it be? Why would you choose it? 5. The heroine in Forget Me Not is a woman of serene faith. It gives her certainty and calm in horrific circumstances. What has brought you calm and certainty in troubled times? 6. Much has been written about the power of prayer. What, to you, is the greatest benefit of individual prayer? Is a group united in prayer for a specific purpose more or less powerful than individual prayer? 7. The heroine is warned that “some people are the opposite of what they appear to be.” Have you found this to be true? What about people of great wealth, like Gregory, who endowed inspiring works of art, gave prestigious scholarships, and benefitted charities? Can people who do these things yet live dissolute personal lives be redeemed? Can enduring humanitarian works help erase the personal harm done by an unbelieving, evil, or corrupt personality? Or must that redemption be made solely through repentance and God’s grace through Jesus Christ? 8. We all have challenges and bear burdens. 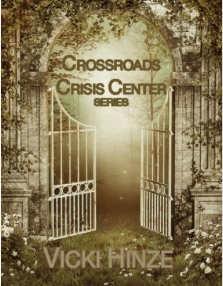 Matthew 11:28 inspired the entire CROSSROADS CRISIS CENTER series of books. In times of trouble and burdens, has your relationship with God given you rest? Has that aided you in coping with your challenges? Resolving your conflicts? Easing your burdens? 9. The hero and heroine are wealthy people. Is it harder, do you think, to be a rich or a poor Christian? What makes it harder or easier? Do material possessions impact a person’s inner life at all? 10. Repeatedly, the heroine hears God’s instructions: Be patient with him. The heroine listens and tries. It isn’t always easy. Is being patient difficult for you? What experiences have led you to trust God’s timing? 11. Ben had a loving, content marriage. As a widower, he had challenges starting over in a new romance. If you suffered such a loss, what would encourage you to (or discourage you from) “trying” again? 12. The heroine was orphaned, abused, and mistreated. Often in abuse cases, those abused become abusers. Yet she did not. Neither did she grow bitter or engage in destructive self-pity. Instead, she made God her escape plan from the abuse and learned to pray. She relied on Him and as an adult commits to helping others stay safe. That is this story’s tie to Matthew 11:28. Did her reliance on God, her trust in Him, break the typical cycle so often present in abuse cases? 13.Have you experienced situations like the heroine’s where you felt the hand of God at work in your life? If so, please explain. 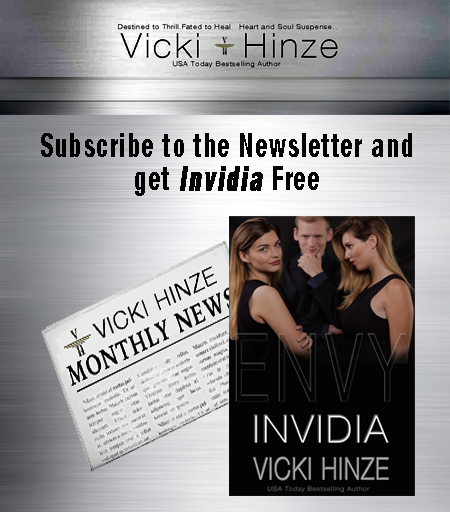 “Vicki Hinze’s name on the cover always guarantees a great read. 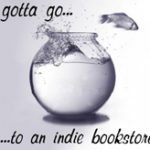 “ –Jeff Ayers, Thriller Reviewer Library Journal, Seattle Post-Intellgencer, and Writer Magazine. ITW Interview.